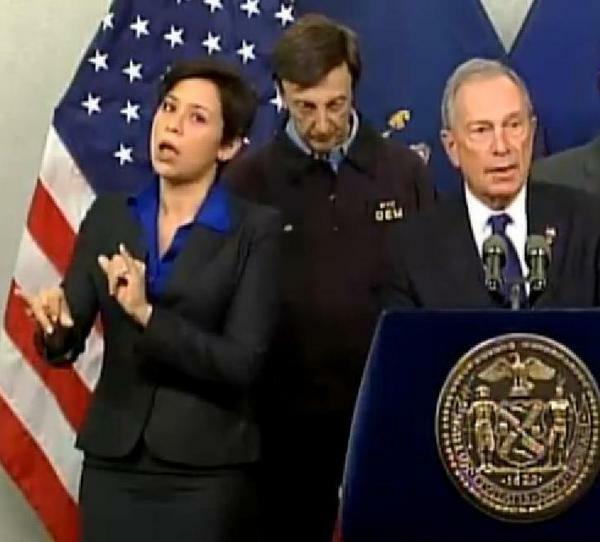 Fans like her style: Mayor Michael Bloomberg (at right) briefing New Yorkers about Hurricane Sandy on Monday. At left is his sign language interpreter, who the mayor identified as Lydia Callis. Since we noted Monday that the sign language interpreter for New York City Mayor Michael Bloomberg (I) was becoming an Internet sensation, her fan base seems to have kept on growing. Identified by the mayor as Lydia Callis, her expressive style has fascinated many and provided a bit of a bright light amid all the dark news about Superstorm Sandy. As New York magazine says, she's given "New Yorkers a legitimate reason to smile" during some very hard times. Now, as happens these days, there's a Tumblr page — Lydia Callis's Face For NYC Mayor — and the discussion about her continues on Twitter. If you haven't seen what folks are finding fascinating, there's a video here. "Linda Siple, a professor in NTID's ASL and Interpreting Education program, recalls Callis as 'highly motivated, gracious and professional. ... She was very motivated with the deaf community here at NTID.' "
According to Livadas, "American Sign Language uses not only hand signs to form words, but relies on body language and facial expression" and is "the fourth-most popular foreign language taught on college campuses (behind Spanish, French and German)." Greg Livadas, spokesman at The Rochester Institute of Technology's National Technical Institute for the Deaf, emailed us to say that Callis is 2010 graduate of the school's American Sign Language and Interpreting Education program. Livadas adds that RIT has "the oldest and largest interpreting program in the country." Update at 11:15 a.m. ET: New York magazine says her last name is spelled Callis, not Calas. We've changed our reference above.